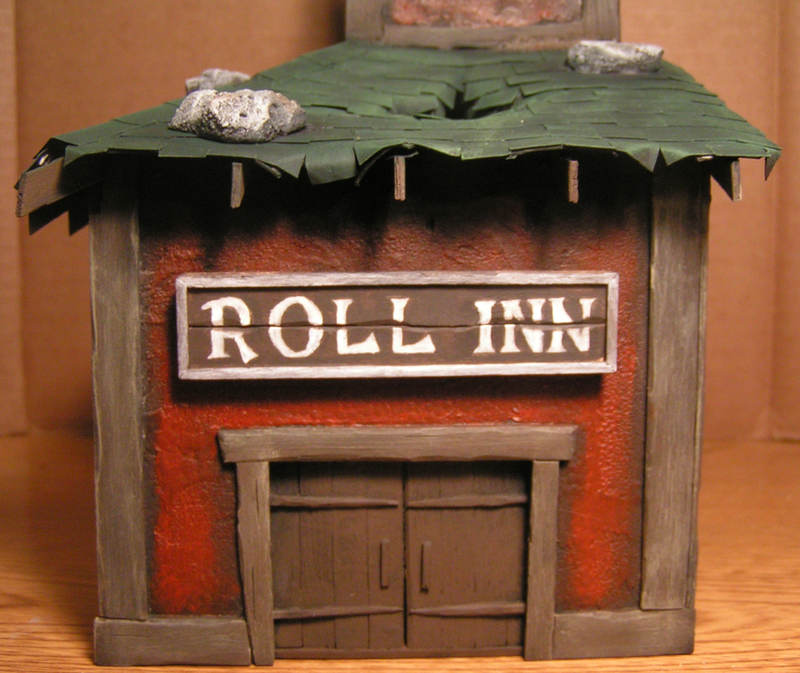 Welcome to (Mordheim Dice Tower) “Roll Inn”! The most comfortable beds this side of the City of the Damned;). I painted all of the cement and debris with the same Dry Brushing Cement system I used on my last building (which I ended up using on the window bars as well). I chose to do a bright, barn red for the walls. 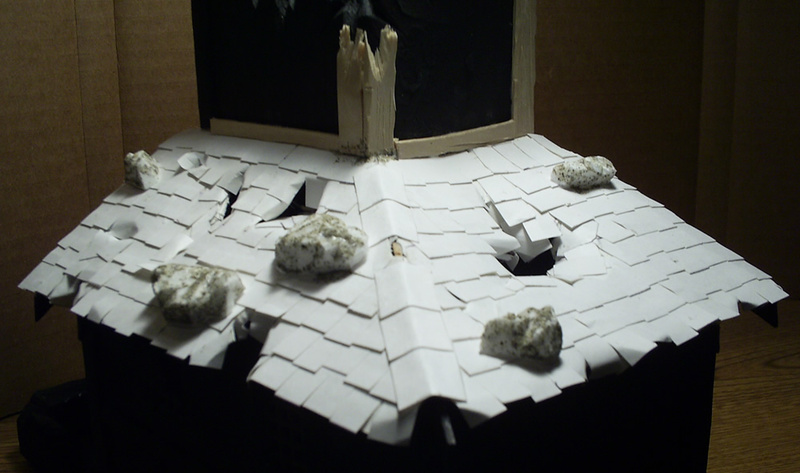 I have added some fallen debris to the Mordheim roof. The idea is that when the comet crashed into the city, either the quaking earth or a shard of the comet caused the top section of the tower to collapse. Some of the rubble broke holes in the roof below, while some of the smaller pieces ended up staying on the roof. 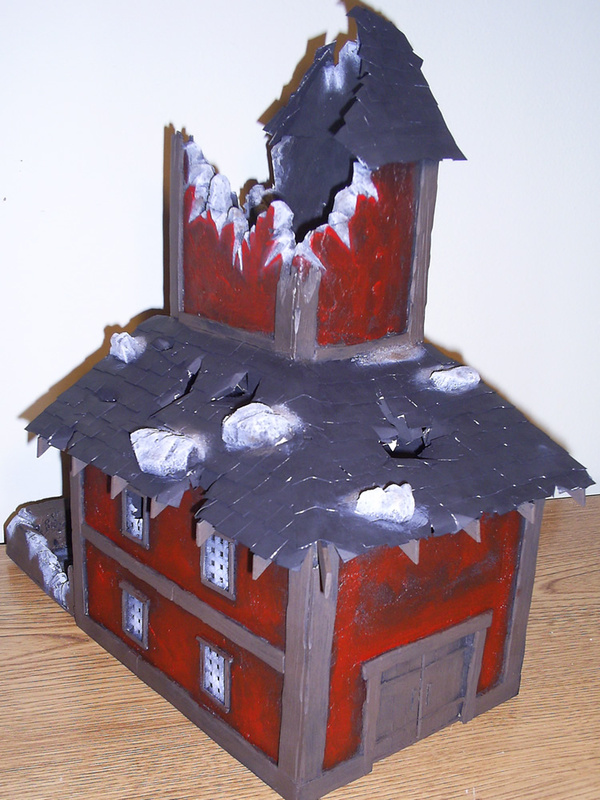 The rubble also doubles as places for models to sand on. 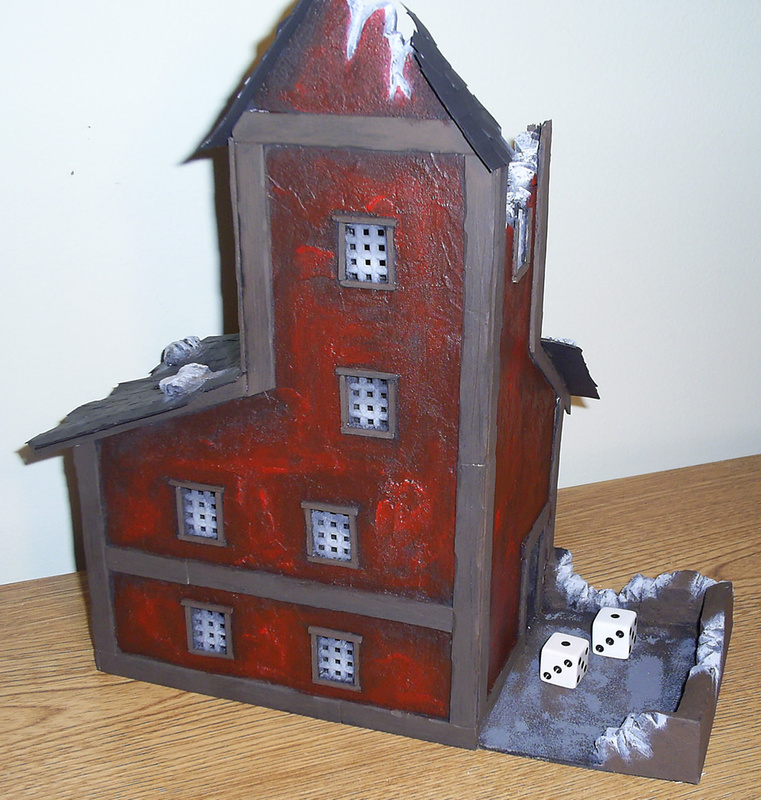 I put down a layer of water glue in the dice catcher/courtyard area, and poured some of my “Camp Cherry Valley” beach sand on it. I think it came out really well. 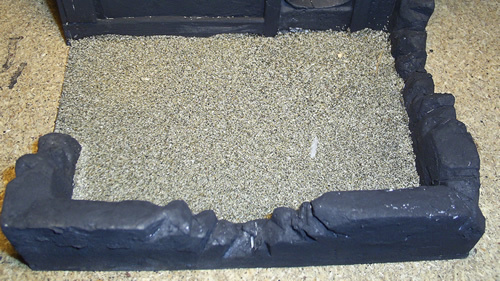 Now I just need a good thick layer of paint to keep the sand in place. 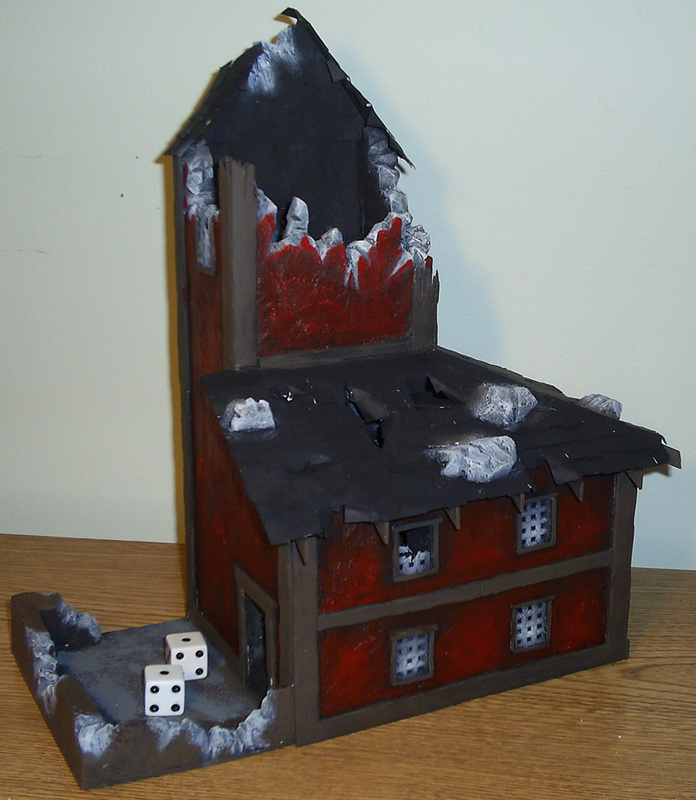 I really want to add some rubble to this area, but I don’t want to give the dice a possibility of not landing flat, so it’s got to be boring and flat. 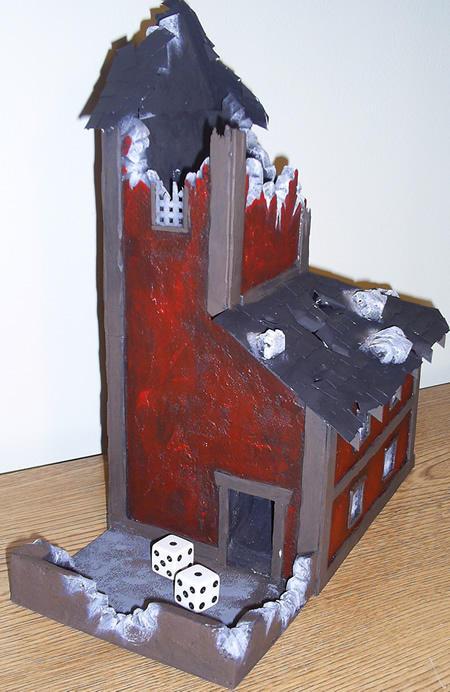 Here’s a picture of the what’s left of the Dice Tower’s Roof. 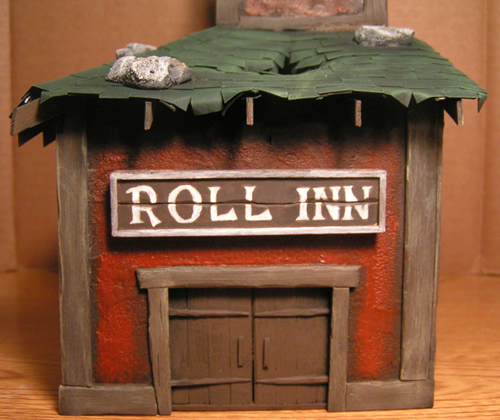 A wealthy city, like Mordheim used to be, must have some sort of system to dispose of waste. Mordheim must have had garbage cans and a garbage collector, wouldn’t you think? Anyway, after my last trip to the range (Front Sight), I grabbed 4-5 of the empty bullet holders, knowing there must be some way to use them in the city of Mordheim. After lots of thought, I found that they are almost the perfect size for Mordheim-sized garbage cans! In this picture you can see the transition (from left to right) of Bullet holder to Mordheim garbage can. First, you need to cut one of the can’s out of the container with a razor blade. Once this is done, trim the edges around the top of the can. Then cut off the bottom of the can. If you cut straight enough, you can use the bottom as a lid. The can on the right side of the picture above still needs some work on the paint job, but it’s enough to give you an idea of where I’m going with this. I also don’t have a bottom to these cans, but I’ll think of something by the time I need to put one on it’s side. After a week of nerve-racking waiting, my Warhammer starter set has arrived! It was apparently too big to fit inside my mail box, so the mailman just had it balanced on top of it. That’s definitely the first time that has happened to me. You can see in this picture sets of 4 regiments of 18 guys. From Left to Right: Orc Warriors, Orc Archers, Human Riflemen and Human Spearmen. This box also includes a Human canon and an Orc War Chariot and a General for each. At the top of this picture, you can see two stacks of 4 sprues each. 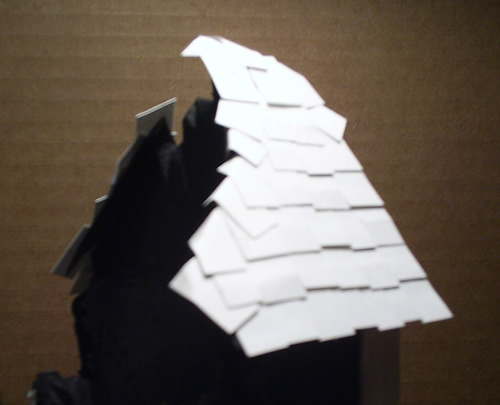 These are the regiments of warriors; one stack for the humans and one for the orcs. I’m looking at selling or trading some of these sprues as this is more than enough for two warbands of each species, and I’m only putting together 1 of each.